Susan Faludi had been estranged from her father, Steven Faludi, for two decades when she learned he had had gender reassignment surgery and was going by Stefánie. I've got some interesting news for you. I've decided that I have had enough of impersonating a macho aggressive man that I have never been inside. The letter was signed, "Love from your parent, Stefánie." Faludi's 76-year-old father, Steven, had had gender reassignment surgery. It was the last thing Faludi expected, given the man she remembered. "My father was the sort of quintessential domineering, hyper-masculine patriarch who forbade my mother to work and was aggressive in all the classic ways, and even — toward the end of my parents' marriage — violent," she tells NPR's Renee Montagne. "So this 180-degree turn threw me for a loop for sure." At the same time, the letter gave Faludi a mission: She had earned her reputation as a feminist by writing about gender roles, and her thoughts were largely in reaction to her emotionally unavailable bully of a father. Now this email offered an invitation into his — now her — inner life. Faludi packed her bags and made her way to Budapest, Hungary, where her father was living. In the Darkroom is Faludi's book about her father's journey. Stefánie Faludi died in 2015. When I first arrived in Hungary, my father arrived at the airport to greet me wearing a kind of a traditional matronly outfit with a big white pocketbook and pearl earrings. And in those first few weeks my father seemed quite insistent on projecting a 1950s Doris Day womanhood. He seemed to want to go back to a period where women were in the kitchen, and even was referring to herself as "the dumb broad" and had this notion that to be a woman was to be taken care of, to have men "kiss your hand," which is a very traditional Hungarian phrase. And so here am I, this devoted lifelong feminist who rebelled against these very characteristics of femininity, listening to my father extol them. A trans friend of mine was very helpful on this point when I was puzzling over it and she said, "Think about it as a kind of delayed adolescence." And I had to think back, embarrassingly, to my 13-year-old self who was obsessed with Maybelline and how to put on mascara. And I think with my father, also, this extreme femininity was a way of breaking out of a previous life of extreme masculinity. She had to counter one with the other. My father, when I was growing up, said very, very little about her experience as a child. She was a wealthy Jewish teenage boy living in Budapest until the war, in which many of our family members perished. And my father [tried] to pass as Christian with false identity papers and a stolen fascist armband, and even used that armband at one point to rescue my grandparents. So growing up I had a few little glimpses, but my father would shut down the conversation immediately, sort of typical of many Holocaust survivors. So when I went back to Hungary, I very much wanted to know that early story and how it fit in with my father's multiple identity transformations. And in a sense that gets at the core of the story I'm trying to tell about identity and what is this thing — identity — that we are all so obsessed about? And a lot of the questions I have about identity boil down to whether identity is something you choose or the very thing you can't escape. And my father's own understanding of that exploration was essential to her figuring out something about herself and to attaining a certain peace with herself. Life doesn't give you any simple, quick fixes. ... In many ways, of course, she was still the same person inside — still had to grapple with the same problems. But I do know that my father never regretted the surgery and it did seem to give her some relief. In particular, she felt that as a man ... she would say over and over again, "I wasn't able to communicate," and that as a woman she felt it gave her permission to reach out to people, to ask for things, to be more open. And that was an enormous relief for her, to break out of that isolation. And so I do think, ultimately, she gained a measure of peace from her change. Whether it would have been her final change, if she had lived longer, I don't know. Before Caitlyn Jenner, before complex and charming portrayals of transgender characters appeared on TV and in movies, Pulitzer Prize-winning writer Susan Faludi received a stunning email from her father. It was the summer of 2004, and the two had been estranged for two decades. SUSAN FALUDI: (Reading) Dear Susan, I've got some interesting news for you. I have decided that I've had enough of impersonating a macho-aggressive man that I have never been inside. Love from your parent, Stefanie. MONTAGNE: Yes, Susan's 76-year-old father, Steven, had had sexual reassignment surgery. It was the last thing Susan expected, given that the man she knew was a household despot. FALUDI: My father was the sort of quintessential, domineering, hyper-masculine patriarch who forbade my mother to work and was aggressive in all the classic ways and even, toward the end of my parents' marriage, violent. So this 180-degree turn threw me for a loop. MONTAGNE: At the same time, it gave her a mission. Susan Faludi had earned her reputation as a feminist, writing about gender roles, largely in reaction to her emotionally unavailable bully of a father. Now this email offered an invitation into his, now her, inner life. 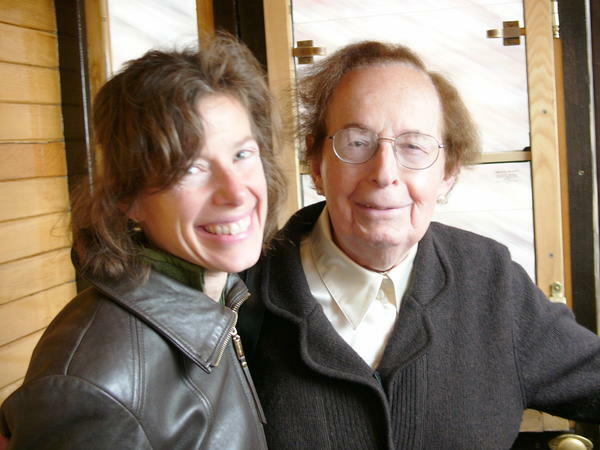 Susan Faludi's new book traces that journey. It's called "In The Darkroom" because her father was a photographer who specialized in altering images. FALUDI: My father was the great illusionist and the great trickster. My father was a real master of the art of quote, unquote, "trick photography." And that is the approach he took with so much of her experience. Throughout her life, whether playing the consummate all-American dad in Westchester County, my father was always putting on a sort of series of impersonations. MONTAGNE: Beginning with an impersonation that saved the young Steven's life. Born into a wealthy Jewish family in Budapest, Stefanie was a teenage boy during the Nazi occupation of Hungary. FALUDI: In which many of our family members perished - and my father, trying to pass as Christian with false identity papers and a stolen fascist armband - and even used that armband at one point to rescue my grandparents. So I - growing up, I had a few little glimpses. But my father would shut down the conversation immediately - sort of typical of many Holocaust survivors. MONTAGNE: Her father's 2004 email announcing that Steven was now Stefanie came from Hungary, where she now lived. In the book, Faludi describes arriving in Budapest and encountering her father as a woman. FALUDI: In those first few weeks, my father seemed quite insistent on projecting a 1950s, Doris Day womanhood and had this notion that to be a woman was to be taken care of, to have men kiss your hand. And so here am I, this devoted, life-long feminist who rebelled against these very characteristics of femininity, listening to my father extol them. MONTAGNE: Yes, and what - what you were first meeting, when you first saw your father again, was that she was basically like an adolescent girl. I mean, she was in the early stages of figuring out who she was, down to the, you know, what should I wear? FALUDI: Yes. Well, you know, a trans friend of mine was very helpful on this point when I was puzzling over it. And she said, think about it as a kind of delayed adolescence. And I had to think back, embarrassingly, to my 13-year-old self, who was obsessed with Maybelline and how to put on mascara. So - and I think with my father also, this extreme femininity was a way of breaking out of a previous life of extreme masculinity. We ultimately came around to an exploration of her past and to my father's own understanding that exploration was essential to her figuring out something about herself and to attaining a certain peace with herself. MONTAGNE: Did, in the end, your father's change in gender give her what she needed - a wholeness, you know, and a center? FALUDI: Well, you know, life doesn't give you any simple, quick fixes. But I do know that my father never regretted the surgery. And in particular, she felt that, as a man, that she couldn't - and she would say over and over again, I wasn't able to communicate and that as a woman, she felt it gave her permission to reach out to people, to be more open. And that was an enormous relief for her. MONTAGNE: ...Without her becoming - going from being a man to a woman. And there's this moment when the two of you are on the dance floor. You're in Budapest, and Michael Jackson is playing. That scene just seemed like finally you touched each other. FALUDI: Yes, and literally in that my father had brought me to a trans disco party in this abandoned factory building on the outskirts of Budapest. So my father, toward midnight, finally got up the courage to get up and start dancing and was dancing by herself. And I sat there watching him for a little while and then got up and started dancing. MONTAGNE: Just the two of you on the dance floor. FALUDI: Yes. And one of the great, great gifts of this invitation back into my father's life is that I was given this opportunity, which I think is probably every adult child's fantasy, to figure out this person who I had grown up with and ask everything I wanted to know. It was sort of a dream come true for a child who really never understood who this mystery person was in her midst. MONTAGNE: Well, thank you very much for joining us. FALUDI: Thank you so much for having me. Transcript provided by NPR, Copyright NPR.